Do other animals have social rules? Welcome to the first in a series of snippets highlighting uncommon facts about common animals. Today: pigeons. They’re one of those iconic aspects of city life, along with skyscrapers, cars and slow people who get in your way (or should that be rude fast people who are always in a rush?). Rock pigeons (Columba livia), including domestic pigeons and feral pigeons (also known as street pigeons or city pigeons), inhabit a large proportion of the globe due to their ability to exploit human buildings for nesting sites, and human rubbish for food. Feral pigeons are descended from domestic pigeons who themselves were descended from the original wild rock pigeons found naturally in southern Europe, northern Africa and southern Asia. Most city dwellers think of pigeons as dirty, diseased and stupid animals. I myself am guilty of calling them ratbirds on several occasions. Most of us know that pigeons have extraordinary capabilities for navigation, having been selectively bred as messenger birds, but did you know that pigeons have been used in cognitive research for over 50 years? Researchers have trained pigeons to discriminate between pictures of various classes of objects, showing evidence that the pigeons can apply what they’ve learnt to new pictures that they hadn’t seen before, even for complex and abstract objects. In one of the first such experiments in the 1960s, pigeons were trained to peck at photos that contained humans and not to peck at photos that contained no humans . The pigeons were able to do this sucessfully, including for photos that they hadn’t seen before. In the 1990s, pigeons advanced to distinguishing picasso-like paintings from monet-like paintings, like little feathered art connoisseurs . The researchers involved in this behavioural research argue that this ability reflects the pigeons’ capacity to conceptualise different classes of objects, indicating that most birds and mammals are probably capable of conceptualisation. Although it’s still unclear whether pigeons and other animals conceptualise things in exactly the same way that we do, it makes sense that animals are able to remember and respond to different categories of objects using visual cues. This ability is presumably useful for categorising things in the environment, for example things that are likely to eat you and things that are not. However, it is unclear from this research exactly which cues the pigeons use to distinguish among categories. This makes me wonder whether animals have folk taxonomies of their own, and how they might categorise objects differently to us (if you haven’t read my post about classification systems, you can do so here). Researchers have also provided evidence for pigeons’ ability to match rotated symbols (a common task in IQ tests that humans often struggle with), and their numeracy skills, among others. So next time you pass a pigeon in the street you might just wonder what’s going on in that little brain of theirs! Herrnstein RJ, Loveland DH. 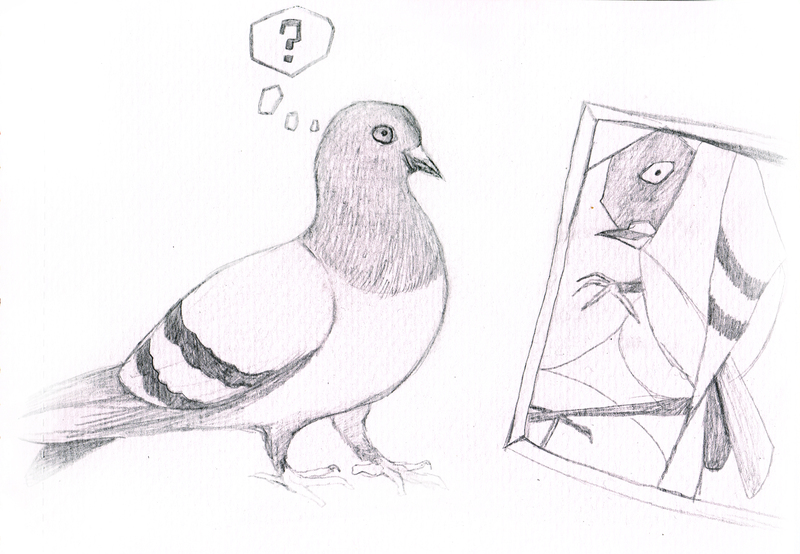 Complex visual concept in the pigeon. Science. 1964 Oct 23;146(3643):549-51. Watanabe S, Sakamoto J, Wakita M. Pigeons’ discrimination of paintings by Monet and Picasso. Journal of the experimental analysis of behavior. 1995 Mar 1;63(2):165-74. The Rabbit Hole is an adventure in the living world for nature lovers and a home for strange stories. In each blog post, animal nerd Dr. Belinda Burns highlights a new topic exploring animal behaviour, evolution or science for fellow nature nerds. In each 'strange stories' post, Belinda shares a short fictional story.